Potter Darren Ellis shares his passion for ceramics, his inspirations, and gives advice to aspiring crafters. Hi Darren, thanks for speaking to us today! Firstly, how long have you been doing pottery and what inspired you to start? Not coming from a family of artists or makers, I wasn’t exposed to ceramics or clay growing up. I’ve been working with clay for 13 years counting education: one year in foundation, three years at University (Wolverhampton), three years with Lisa Hammond (MBE), two of which were as an apprentice and the rest out on my own. It was that first few weeks in foundation that got me hooked, although it wasn’t the touch of the clay or how responsive and malleable it is as a material. It was the problems that arose from working with clay, so many things to solve and understand, and with all that came the many techniques to learn. I grew up working in my parents’ textile mill watching my father fix and maintain the old Victorian machines that I loved. You can’t just buy new parts, you have to learn how they work and fix them. This is where I believe my attraction to working with clay came from, learning and solving problems. That’s great! Other than the problem-solving aspect, what do you enjoy most about pottery? It would be the throwing, the time sat on the wheel. Not the creative aspect of making something new or the challenge of throwing a difficult form, but the repetitive throwing of simple shapes. I don’t need to concentrate; my hands know what to do. The years of practice are paying off and I can go into auto pilot and enjoy the ease of it. I’m not the most accurate of throwers and if one pot from a batch is 1-2mm taller, then so be it. I remember a conversation I had with Svend Bayer during my apprenticeship in Devon. He told me that when he makes a new form such as a bowl, plate, jug, etc., he would make 200 just for the practice to understand the form and gain the muscle memory needed. Then he would reclaim them all before making them again to sell. This really stuck with me, the idea of being able to really understand a form and repeat it after only making 200 is quite incredible. So, it’s those moments, the ones I get lost in while throwing, filling a board with pots without realizing any time has passed that I really enjoy. It makes me appreciate what I’ve learned and the time I have been lucky enough to give to my making. It sounds like a really interesting process! What is your favorite thing to make and why? I find it unusual to have a favorite ‘thing’ to make, for me it depends on the situation. Almost everything I do make is made to be used in the preparation, cooking and serving of food, with the real enjoyment coming from seeing how people use my pots. Sometimes the feedback comes from an email or a picture posted on social media and in some cases from a newspaper or recipe book. This would make the cooking pots my favorite things to make, such as the lidded casserole or oven dishes. My go-to thing to make if I’ve spent too much time away from the wheel would be bowls, a form that’s simple and easy to make, to build up confidence. However, the challenge of throwing larger forms, especially jugs or pitchers, could make these my favorite pieces to make. I once read that the jug is the equivalent to the artist’s self-portrait and any of the great potters, past and present, can easily be recognized by the jug and pitcher forms they made. Michael Cardew’s book Pioneer Pottery has some wonderfully simple illustrations to explain how to achieve a lively and athletic pot combining grace and strength but to execute this is another matter. I love the challenge. So, for all those aspiring potters out there, what is one piece of advice you would give for getting into pottery? For those who are just looking to break from the constraints of a “normal” job, just have a go and have fun doing it. But do try throwing, there is nothing else quite like it in any other craft – whether you are good or bad at it, everything made will have its own character that will make you laugh or smile! For those looking to make a lifestyle from pottery and making to sell as part, or all, of their income, I can only comment on ways to which I do as a small batch studio potter. My advice would be to learn how to throw quickly and efficiently, putting in the time to train. Working with a professional potter as I did or doing full time throwing courses will also teach you how to juggle the running of a pottery. When running a studio, you will find that you may only have 20% of your time throwing at the wheel with other tasks such as finishing, clay prep, glaze prep, kiln packing and maintenance, advertising, paper work etc. eating the rest of your time. So, making 20-30 pots in that time won’t allow you to earn enough. Great advice! Finally, what are your interests outside of pottery? I work a lot and have little free time, but I do really enjoy cooking which marries well with pots! Funds dependent, every time I visit a ceramics show as an exhibitor or a customer I do try to buy a piece. I tend not to keep any of my own pots, but when using pots made by other potters there is so much to learn and the best way is to use what the pots were intended for! Any time I do have spare is spent volunteering my time as a trustee to Adopt a Potter working with a team that helps run a charity designed to fund apprenticeships. 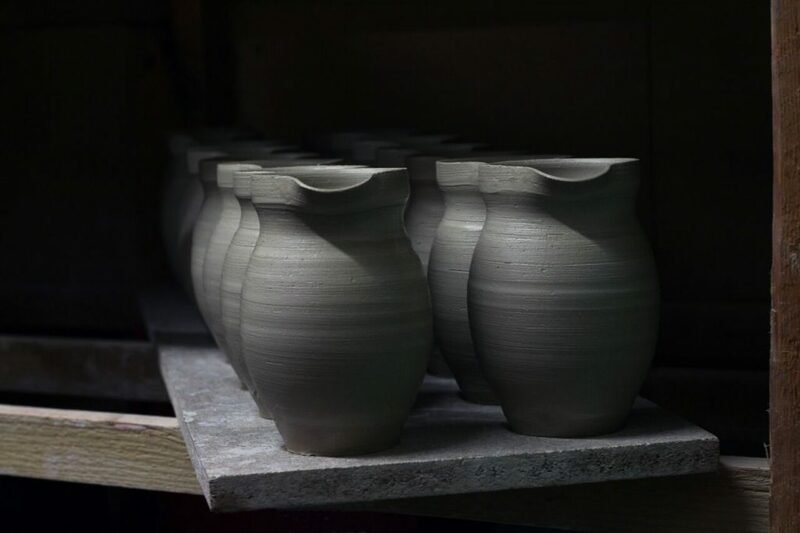 This has developed and led to the opening of Clay College Stoke both of which aim to help the next generation of potters as a direct response to the closure of so many ceramic departments in universities over the years. Find out more about Darren’s work on his website.